Doesn’t that photo make it seem like you could just reach out and touch it? 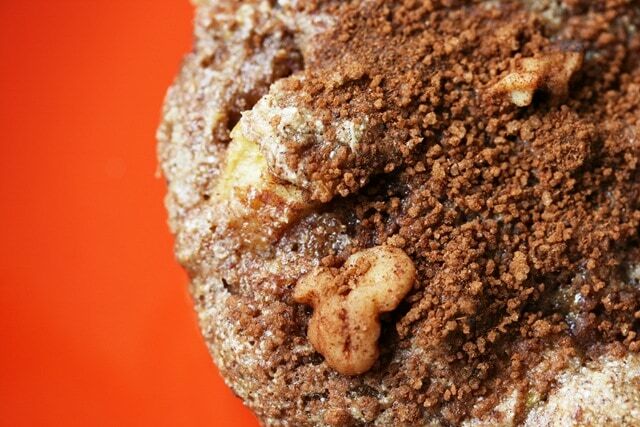 I freaking LOVE muffins. Especially these. No butter, no oil, lots of protein (from the spelt, milk/yogurt, and egg), and entirely whole grain. Awesome. Preheat oven to 300 (spelt bakes more quickly than regular flour!). In two large bowls, separately mix dry and wet ingredients. Add wet ingredients to dry, stirring until mixed. 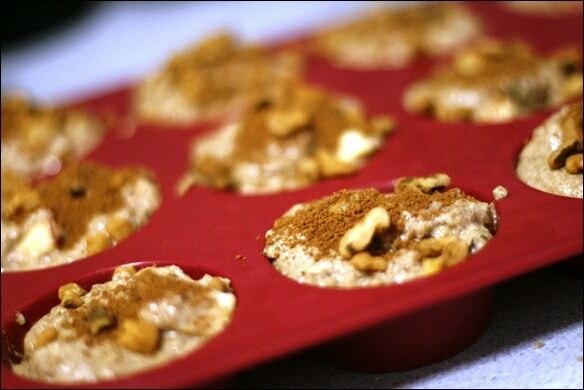 Spoon into a cooking-sprayed or nonstick muffin pan. 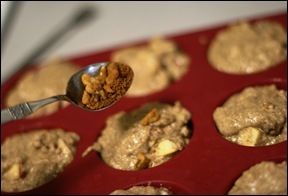 Top each muffin with a sprinkling of topping mixture. Bake for 30 minutes — fork check to make sure they are done. 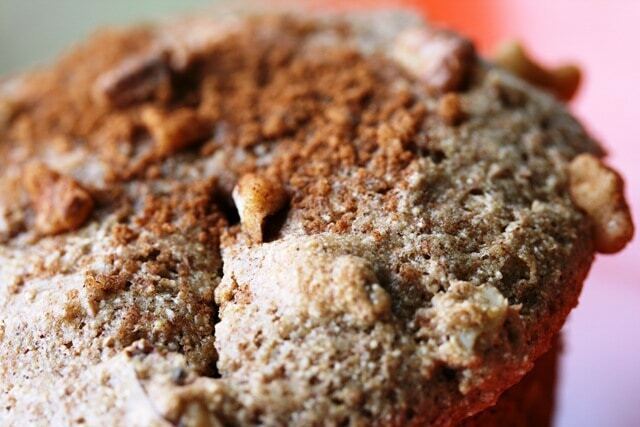 These muffins are soft, bursting with juicy apples, and have a nice, crunchy cinnamon spiced topping. Perfection. The only snafu? 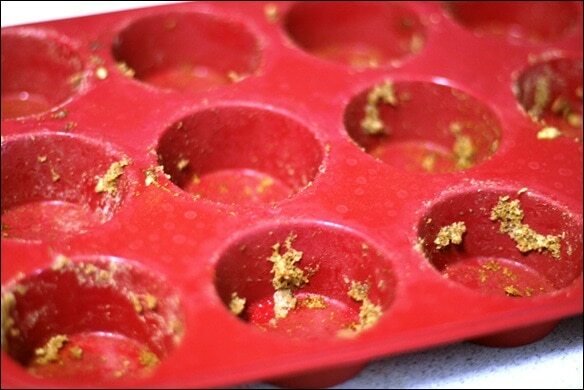 I tried this new rubbery muffin pan that I got for Christmas. It’s supposed to be one of the ones where you don’t need any nonstick spray/grease and you can easily pop out the muffins when they are done (the pan is flexible). But it didn’t work very well :( Have any of you tried these pans? Do I need to let the muffins cool first? What did I do wrong? I went on a 7-mile hike yesterday, and these definitely would have been great fuel! Yum!! 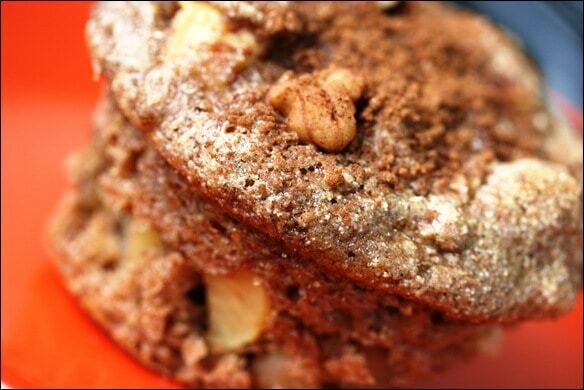 …feel your pain on the muffin tin. i have the same kind and i never use it because stuff always sticks to it and it’s impossible to clean. These look delicious! 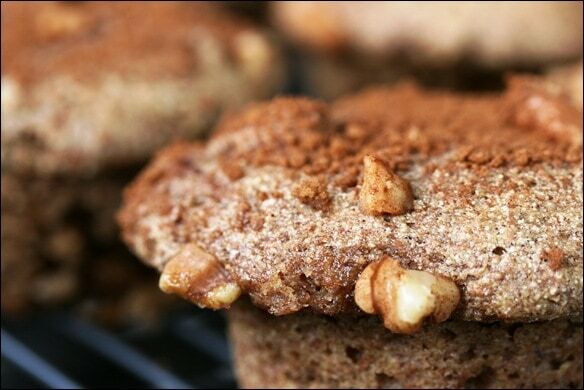 Do you think the recipe would work with whole wheat flour instead of spelt without making other changes? 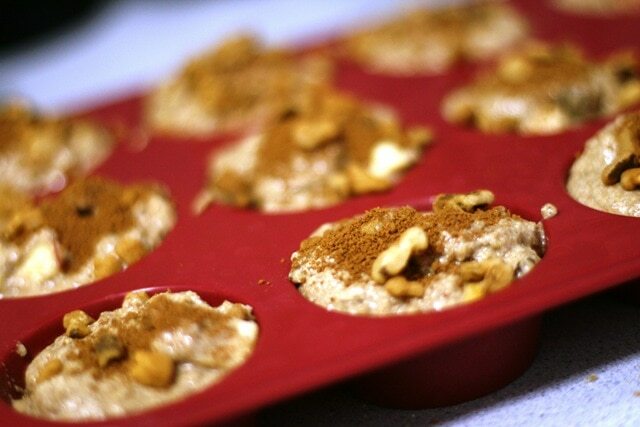 I’ve been meaning to try spelt but these look too good to wait until I can make it to the store! I would recommend using spelt flour :) You could try WW pastry flour (not regular WW flour – it would be too dense), but I’m not sure it would turn out as well since the ratios might be off (spelt flour usually requires less liquid than regular flour). Yummy!! I love apples in baked goods. This be delicious for an afternoon snack with a cup of coffee! AH, these look so good! I bet they taste better than the recipe they were based on. I’ll have to give them a try. I would recommend using spelt flour :) You could try WW pastry but I’m not sure it would turn out as well since the ratios might be off (spelt flour usually requires less liquid than regular flour). Another fannetastic recipe to add to my collection. Can’t wait to try it. Went to see “Black Swan” today. It was very intense like you said, Anne. I am going to leave these kind of movies for you younger girls to enjoy. I was depressed when I left the movie. I like to be happy when I leave a movie. I know, I’m a bit of an old foggie. Sorrrrrrrry. I did enjoy getting out. I just wish I had won the argument of getting out with a movie like Gone with the wind Part 3. I told you I was an old foggy. Oh well, we are what we are. I love hot bigg the muffin tops are! My fav part! Going to make these tonight! 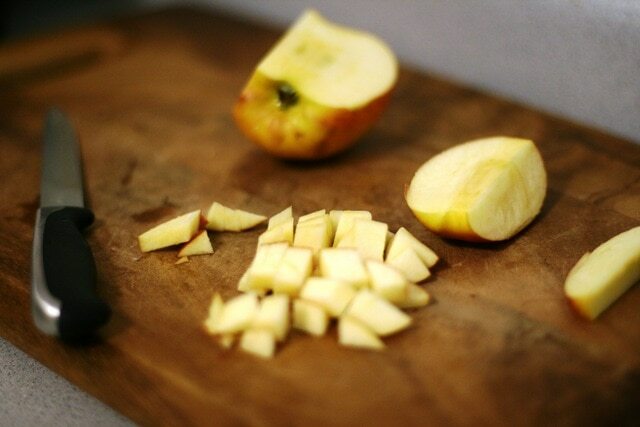 I have a bunch of apples I need to use up, and these look delicious! Everything is better with a crunch topping! Those muffins look AMAZING! If I cant eat gluten, what flower do you suggest using instead of spelt?? I don’t know much about gluten-free flour – anyone else have any thoughts? I have seen gluten-free flour in some of the grocery stores. Ask your favorite grocery store manager and if he is like mine, he will order it for you. I know a lot of people have a really hard time with gluten. Spelt does contain gluten, although not quite as much as wheat. I have one of those pans too…letting things cool in the pan for about 10- 15 minutes before you try and pop them out works pretty well. It’s not foolproof but letting things firm up a bit makes it much easier; and hey if one falls apart you have to make sure they turned out OK…right ;). Oh my, these look INCREDIBLE!!!! oh MY! these look AMAZING! I cannot WAIT to try them! I think i still have some spelt flour in the house!! Those pans only work well for me if I use oil in the recipe (guess it helps them not stick?) When I sub applesauce or something else it always sticks! 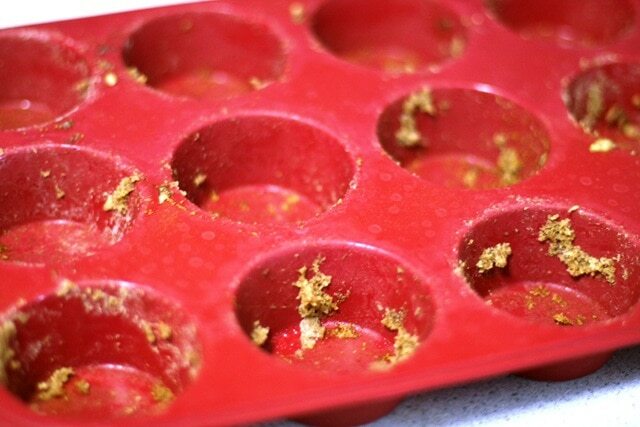 I have those same muffin tins and I usually use butter/cooking spray to coat them first. The muffins look amazing! Will have to try them. Using Bakers Joy instead of regular non-stick spray works pretty well. 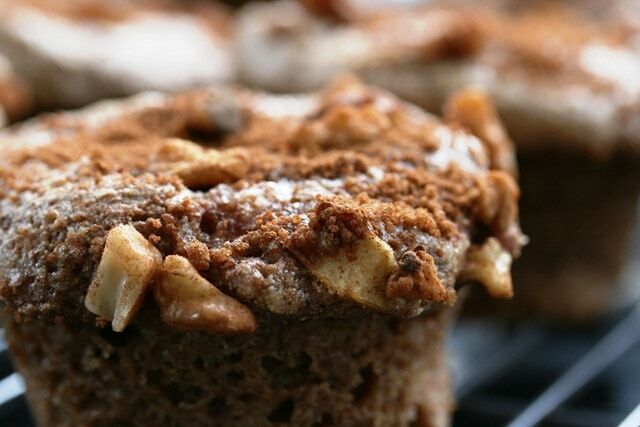 Why don’t you start selling your delicious looking bake goods to your readers. I will be a frequent buyer. Make some money on the side. Entrepreneur fannetastic. Ohhhh I DO want to reach out and touch them! I love that they include real apple chunks. Well Anne you did an amazing job with this recipe. Made a batch for the family for breakfast and snack time and they went thru them with aaahhhs and uums. I am preparing to make my second batch knowing they will be eaten! I too like non wheat baked goods and was wondering if you ever used red fife flour? I’m so glad your family liked them! :) I’ve never even heard of red fife flour – what is that? Hi, I went to the natural grocery store last night to buy some spelt flour and they had both brown and white. I ended up getting white–is that okay? 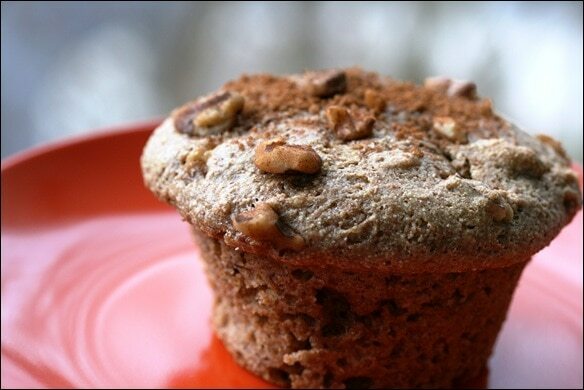 My family loved these muffins–even my 10-year-old brother woofed them down! These turned out perfect! Yum, thank you. I used Vanilla Almond Milk and just regular yogurt (didn’t have Greek at home) and it was great – no weird tastes. Loved these! I use spelt in all my baking so it was great to find a recipe where it called for it, as i didnt end up with lumpy sunken muffins like i have in the past. I used apple sauce instead of milk, and maple syrup instead of sugar, and threw some oats into the crumble topping. Delicious and healthy! I made these muffins this afternoon. I couldn’t believe how great they taste. My family loved them. Thanks for sharing the recipe. It’s perfect for the holiday season. You need to grease the non stick pans only the first time you use them, and then don’t soap wash them, just rinse!